Ian and I are flying away (currently somewhere over Spain) from spending four days with his family in the south of Spain. Though the sights were great and I got to experience somewhere new, the best part was probably spending time with his family…though I don’t know if they will consider spending time with me the best part of their trip! I asked them a zillion and one questions that really had nothing to do with anything; you know, all those “what if” questions and asking about their dreams. But, this is my way of bonding, so they will need to learn to cope with it! Though I did learn if I ever got myself into jail the oh-so-kind Clive (father-in-law) would bail me out, but I would have to ride in the trunk on the way home! But, back to the oh-so-warm Spain. We stayed in a condo outside of Marbella. And actually, we didn’t see much of what was around where we were staying, though we did eat breakfast at the beach and walk along it one morning…well more late morning (like 11am). It is hard to get Jessica out of bed very early these days! We took day trips to different places everyday. 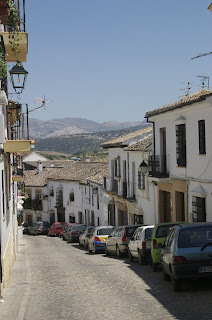 One day we went to a town in the mountains, Ronda. It was quite the cute little town. There were some beautiful views to take in and a bull fighting stadium that I think was famous for something (I need to pay attention more!). 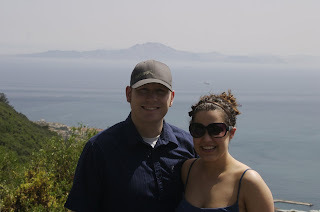 Then, we went to Gibraltar, which is actually a British colony in (well, not “in”, but you know what I mean) Spain. They don’t have any taxes here, so gas was crazy cheap. I couldn’t believe my eyes at the prices (think 35% cheaper than Edinburgh). The main attraction here was a huge rock that we went up that had tons of apes (small ones) all over. After a while, I got a little tired of the apes. They weren’t afraid of humans, I didn’t want them too close to me and got tired of having to look out for them. But this rock, offered great views. The water was very clean and you could see right into it. Also, you could see Africa, which is only five miles away. It is the only place in the world you can see three countries and two continents at the same time (see, sometimes I DO pay attention). 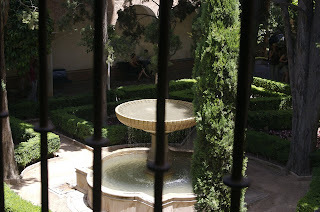 Then we went to Granada, which contained a palace (Alhambra) that used to be muslim. I didn’t pay too much attention (bad me) to the tour, but I believe the Christians overtook it or something like that. Today it is empty and just a tourist attraction. But, it was beautiful and very detailed inside. Now here I am today, on an airplane headed for Germany where more adventure awaits me! Happy 5th Anniversary! I hope you two have a wonderful day together in Germany. Celebrate and enjoy. Can you believe we have all been married for 5 years now! 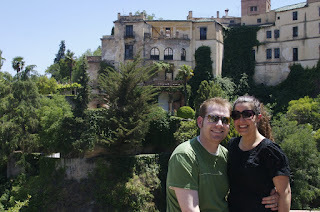 Happy Anniversary and Cheers to the cute and well traveled couple!!! I love your pictures; looks like you are having a great time. And can I tell you how jealous I am of the gas prices?? ?